Concert organizers were searching for a great downtown with the infrastructure in place to accommodate the visitors, as well as a compelling history and story. The Birthplace of Country Music rose to the top of the list based on the cities rich heritage, Bristol's passion for music and its present-day climate of cooperation. AC Entertainment, an innovative leader in creating, producing, booking, and marketing first-class live entertainment experiences like Bonnaroo Music and Arts Festival, was selected to organize the Bristol leg of the tour. AC knew of Bristol Rhythm & Roots Reunion and was quick to contact the festival and Believe in Bristol. The deal was sealed upon a clandestine visit to Bristol by the band. They knew The Birthplace of Country Music was where they wanted to be. We are happy to announce, August 11th, Bristol, VA/TN will host one of four United States stopovers on The Gentlemen of the Road Tour by Mumford & Sons, and other acts including Dawes, JEFF The Brotherhood, The Very Best, Justin Townes Earle, Apache Relay, Simone Felice, and Haim. $1 of every ticket sold will benefit The Birthplace of Country Music Cultural Heritage Center building project. "Something of this magnitude for any Main Street program is amazing. We are truly honored to have this group come to our community," says Christina Blevins, the Executive Director of Believe in Bristol. "Mumford & Sons are coming here because we came together as a community to embrace our music heritage. We are a live music destination." "This is another opportunity for Bristol to shine on an international scale. The Birthplace of Country Music is a living thing," says Leah Ross, Executive Director of Birthplace of Country Music Alliance and Bristol Rhythm & Roots Reunion. Live music is part of who we are, and we appreciate the band's recognition of that." 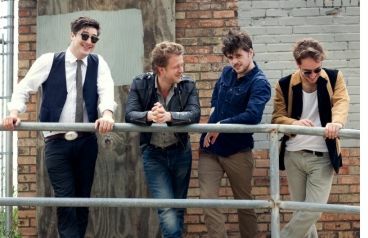 "A band of Mumford & Sons magnitude brings world-wide attention. We will attract young roots music fans from across the Mid-Atlantic and Southeastern U.S.," says Matt Bolas, Executive Director of Bristol's Convention & Visitors Bureau. "The Gentlemen of the Road Tour stopover continues to validate Bristol as a vibrant, live music community." A limited number of tickets for the Bristol Stopover of The Gentlemen of the Road Tour will be available at the Bristol Rhythm & Roots Reunion office at 416 State Street, Suite A, Bristol, TN on Friday, June 1st at 10am for $69 on a first-come, first-serve basis. Tickets for all Stopovers will be available exclusively at www.gentlemenoftheroad.com. More information about featured events at the Bristol Stopover will be released soon. Visitors to the region should search accommodations at www.MyBristolLodging.com. For more information about Bristol, log on to www.MyBristolVisit.com. For more information please contact Christina Blevins, Executive Director, Believe in Bristol. 423-573-2200 or email info@believeinbristol.org. Continue further to read the official press release from Mumford & Sons Gentleman of the Road Tour. Mumford & Sons are pleased to announce details of a series of Gentlemen of the Road Stopovers in the United States this August. Tickets to the Stopovers will be $69, with no additional service fees or hidden charges. Each ticket will include a beautifully designed commemorative Gentlemen of the Road Stopover Passport, and an exclusive digital download compilation album featuring performances taken from various acts across the four shows. Tickets for the Portland, Bristol, and Monterey Stopovers will go on sale Friday, June 1 at 10am local time. The Dixon Stopover will go on sale Saturday, June 9th at 10am CT. Tickets for all Stopovers will be available exclusively at gentlemenoftheroad.com. Mumford & Sons said: "The Gentlemen of the Road Stopover is based loosely upon our favorite festivals like Colorado's Telluride Bluegrass and Scotland's Loopallu Festivals. We want to stop off in towns where bands don't usually tour, and celebrate the local people, food and music. We're keen to promote the town's local businesses, and we'll be using the local bars and venues for after-show parties, whilst working closely with the local people to get everyone involved in making these shows spectacular. There will be a host of our friends playing too, and the vibe falls somewhere between ‘travelling Victorian circus' and ‘Victorian travelling circus'. It should be a whole lot of fun."